As Russia deals with a dramatic fall in the price of oil and Western sanctions over its actions in Ukraine, fewer Russians say the economy is good and that Russian President Vladimir Putin’s actions in Ukraine have led to more favorable views of Russia. Nonetheless, Putin, who has entered his 11th year as leader of the country, garners overwhelming support from the Russian people on both his domestic and foreign policies, including record-high confidence in his ability to handle international affairs. Concurrently, views of Western foreign leaders and powers have plummeted within Russia to their lowest levels of the Putin era. And many consider NATO and Western countries a military threat to Russia. Nationalism is on the rise within the country – very favorable views of the homeland are up sharply, Russians agree that parts of other countries belong to them and a majority says it is a bad thing that the USSR no longer exists. Regarding Ukraine, Russians believe the Luhans’k and Donets’k regions should secede, either becoming independent states or part of Russia. But Russians are divided about Ukraine’s place within the Eurasian Economic Union. Russians express increasingly negative views about the economic situation in their country. 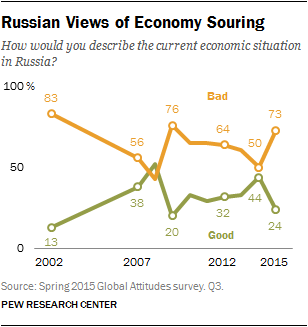 Roughly three-quarters (73%) say the Russian economy is bad, with only around a quarter (24%) saying it is good. In the months following the annexation of Crimea in 2014, positive economic attitudes had risen to 44%. But the fall in the price of oil and Western sanctions have led to a 20 percentage point drop in positive economic sentiments in the past year, despite recent signs that the economic downturn might be less severe than anticipated. Young Russians, those ages 18 to 29, are the most likely to hold positive views about the economy, yet only 32% say it is doing well, compared with 19% of Russians ages 50 and older. Most Russians agree that Western sanctions are having an effect on the economy, but there is a split as to whether it is those sanctions or falling oil prices that are the main culprit for the economic downturn. In all, 45% of Russians say sanctions are having a major effect on the economy, with a further 41% saying they are having a minor effect. Only 8% say they are having no effect at all. A third of Russians say that Western sanctions are causing the most harm to their economy, and another third say that falling oil prices are to blame. Only a quarter fault the economic woes on current government policies. In the wake of annexing Crimea last year, a plurality of Russians believed Putin’s handling of the situation in Ukraine was improving Russia’s image worldwide. Today, Russians are more likely to say Putin’s actions have dampened the country’s international image. A 37% plurality says Putin’s handling of Ukraine has led other countries to have a less favorable opinion of Russia, an 11-percentage-point increase since 2014. 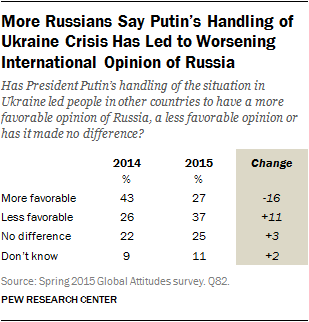 And only 27% say Putin’s actions have led to a more favorable opinion of Russia, down 16 points since last year. A quarter says it has made no difference. There is a slight gender gap on this question. Women (31%) are more likely than men (22%) to say Putin’s actions have made Russia’s international image more favorable. Whether it is for his handling of relations with other countries, such as China, the U.S., Ukraine, or the European Union (EU), or for domestic issues, such as energy policy, the economy and corruption, Putin gets high marks from the Russian people. Majorities approve of his handling of each issue, and he is especially praised for his foreign policy. At the top of the list, nine-in-ten Russians approve of Putin’s handling of relations with China. The two countries have seen a marked increase in cooperation recently, as energy ties and opposition to U.S. policies have forged a common cause between the two powers. But Russians also praise Putin for his relations with the U.S. (85% approve), Ukraine (83%), and the EU (82%), even as he faces sanctions from the U.S. and EU for his actions in eastern Ukraine. While not as robust as his foreign policy ratings, seven-in-ten or more in Russia approve of Putin’s energy policy (73%) and handling of the economy (70%), despite recent negative trends in the price of oil and a subsequent slowdown of the Russian economy. Putin also receives majority approval for a common concern in many emerging countries around the world: corruption. About six-in-ten Russians (62%) approve of Putin’s handling of corruption, though a significant minority (29%) disapproves on this particular issue. Along with their high approval ratings for Putin’s international and domestic policies, Russians also have great confidence in their leader’s ability to handle international affairs. 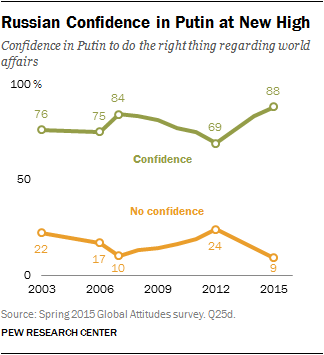 Nearly nine-in-ten (88%) have confidence in Putin to do the right thing regarding world affairs, including 66% who say they have a lot of confidence. Only 9% express little or no confidence in the Russian leader. The 88% rating for Putin represents a new high for his handling of international affairs since Pew Research began polling on this issue in 2003. And Putin gets significantly higher ratings from the Russian public compared with 2012, when massive protests surrounding the disputed 2011 legislative elections threatened to weaken his hold on the country. Regardless of whether Russians blame Western sanctions, falling oil prices or current government policies for harming their economy, vast majorities still have confidence in Putin’s handling of international affairs and relations with Ukraine. However, those Russians who approve of Putin’s handling of relations with Ukraine are more likely to blame Western sanctions for their economic woes, while those few who disapprove are more likely to name current government policies as the cause of the economic downturn. Russians have very negative opinions of Western powers. Majorities in Russia have unfavorable views of the U.S., NATO, the EU and Germany. And these feelings of dislike have intensified in recent years. In the current survey, around eight-in-ten Russians have an unfavorable opinion of the U.S. (81%) and NATO (80%). This includes about half who have a very unfavorable opinion of the U.S. (49%) and NATO (50%). Only 15% and 12% respectively have favorable opinions of these Western entities. While opinions of the EU and Germany are not as bleak, majorities in Russia have negative views of these powers. Six-in-ten Russians have an unfavorable opinion of the EU, and 56% have a negative view of the EU’s largest economic power, Germany. Only around a third have positive opinions of the EU (31%) and Germany (35%). Positive opinions of Germany, the EU, the U.S. and NATO are all at the lowest point since Pew Research began asking these questions in Russia. In the past two years, from before the Ukraine crisis began to now, positive opinions of the U.S. have plummeted 36 percentage points in Russia. Similarly, favorable opinions of the EU have fallen 32 points and views of NATO are down 15 points since 2013. 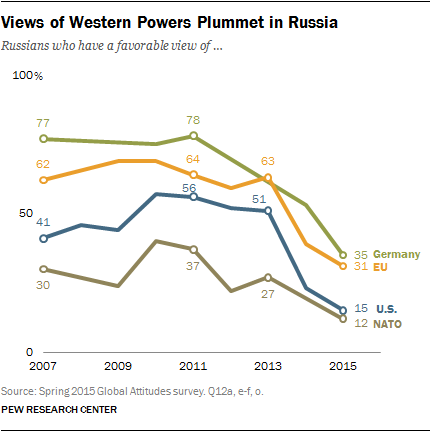 Perhaps most strikingly, since 2011, favorable views of Germany have collapsed in Russia. In 2011, 78% of Russians had a positive opinion of the Federal Republic, but that stands at only 35% today, a fall of 43 percentage points in four years, including 18 points in the past year alone. Meanwhile, only 28% have confidence in German Chancellor Angela Merkel’s international policies, with 66% expressing little or no confidence. And U.S. President Barack Obama gets even worse ratings – only 11% of Russians have confidence in his role regarding world affairs, with 86% expressing no confidence. Among the Russian public, ratings for Merkel and Obama are also at all-time lows. Indeed, since 2012, confidence in Merkel’s handling of international affairs has fallen 20 percentage points in Russia. And in that same time period, Russians’ confidence in Obama has dropped from an already low 36% in 2012 to a dismal 11% in 2015. Coinciding with diminishing positive views of major Western powers, half of Russians see NATO as a major military threat to their country. An additional 31% see NATO as a minor threat. Only one-in-ten say NATO is not a military threat. Older Russians ages 50 and older are more willing to say NATO is a major military threat (55%) than Russians ages 18 to 29 (43%). As the Putin era draws on, Russian nationalism is getting stronger. More than nine-in-ten Russians (93%) have a favorable opinion of their own country. And in the past year, the percentage who have a very favorable opinion of their homeland is up 12 percentage points. Nostalgia for a lost era is also evident. An overwhelming majority of Russians (69%) say that the dissolution of the Soviet Union was a bad thing for Russia. Only 17% say it was a good thing. Older Russians are much more likely to say that the breakup of the USSR was a bad thing (85%). Only 44% of young Russians say the same, though around a quarter (27%) have no opinion, probably owing to the fact that 18- to 29-year-olds were only children or not even born when the Soviet Union collapsed in the early 1990s. Along with high approval of the state and nostalgia for the Soviet era, 61% of Russians agree with the statement that there are parts of neighboring countries that really belong to Russia. This sentiment has remained steady since 2002. However, in 1992, following the breakup of the Soviet Union, fewer than four-in-ten Russians believed that other countries belonged to the Russian state, and still fewer believed this in 1991 (22%). Russians also increasingly say that their government respects the personal freedoms of its people. In 2015, 63% of Russians say this is the case, while only 29% disagree. Since 2008, belief that the Russian government respects its people’s rights is up 18 percentage points. Half in Russia say that Western countries, such as those in Europe and the U.S., are to blame for the violence in eastern Ukraine. A further 26% faults the government in Kyiv for the conflict. Only 4% see rebels from Luhans’k and Donets’k as the cause and a measly 2% say Russia itself is to blame. Few Russians believe that the Ukrainian government respects the freedom of its people. Only 8% say Ukraine’s government respects its people’s rights, while 83% say it does not. This negative view is up 10 percentage points since 2014. Russians are also clear that they do not prefer the Luhans’k and Donets’k regions to remain part of Ukraine. Only about a third (32%) say they would like those regions to remain part of Ukraine, either with the same terms as before the crisis (11%) or with greater autonomy from Kyiv (21%). But 35% would like the Donbas region to become independent, and a further 24% say those regions should become part of Russia. Russians also do not want Ukraine to turn westward. Few support Ukraine joining NATO or the EU. Only 3% and 14%, respectively, support Ukraine joining those Western institutions. However, Russians are divided about incorporating Ukraine into the Eurasian Economic Union (EEU), a supranational body which consists of Russia, Armenia, Belarus and Kazakhstan, with Kyrgyzstan as an acceding state. Only 45% of Russians say Ukraine should join the EEU, with a similar 40% opposed to such an arrangement. Older Russians are more likely to support EEU membership for Ukraine (49%) than are young Russians (39%).